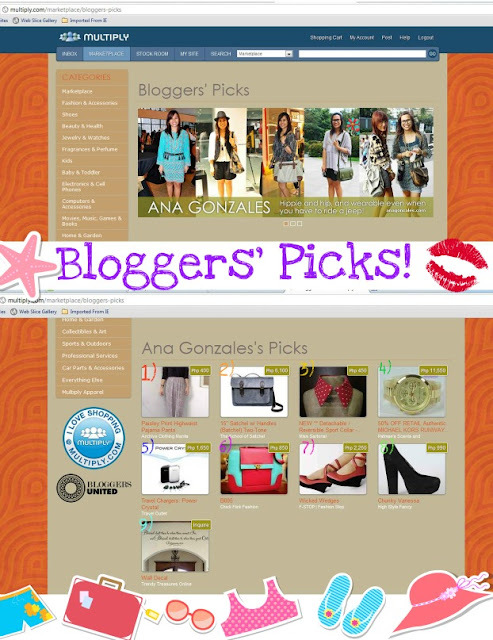 Bloggers' Picks @ Shop at Multiply! Find out what your favorite bloggers will pick in the thousands of choices and online shops available in our favorite online shopping destination...Multiply.Com! The Multiply Bloggers Pick page will be constantly updated, featuring your favorite bloggers, their unique styles, and their neat finds from different Multiply online shops. Be in the know of what's hot through this page! Find out Pax and Melai's list by clicking HERE. Bookmark this page for future features! Thank you MULTIPLY Philippines for this!